The John Roberts Company, like any reputable U.S business, is an Equal Opportunity Employer. If you tour the offices and plant you may find the diverse mix of employees unremarkable. As you walk through the facility some of the employees will make eye contact and offer a polite head nod. No doubt a few will even say hello. If you are lucky you will encounter Gregory Harrison, a Material Handler who started as a temp in 2011 and soon after was hired to work for John Roberts full time. Greg will do much more than say hello. He will make you feel special, and he can do it without even saying a single word. Greg is the sort of person with an infectious smile who radiates cheerfulness, with a joyful spirit and love of life that rubs off on everyone he meets. Greg will make your day brighter and you are sure to remember him long after your visit. He is a remarkable man with an even more remarkable story. Greg wasn’t always the affable and gracious man he is today. Greg’s past is one littered with alcohol and drug abuse, complete with all the trappings of addiction, including being stabbed by his girlfriend in 2006. At the age of 39, Greg found himself incarcerated and without hope. He reached rock bottom, a place of the deepest despair every addict eventually finds. In this darkest time Greg turned to God. He got on his knees and prayed, begging for salvation and release from his tormentor, alcohol. Greg will be the first to tell you his prayers were answered. Granted a conditional release, Greg found himself outside and looking directly across the street at the Union Gospel Mission. Believing it was meant to be he entered through the doors and found a new life. Now married with four children, Greg owns a home on Lake Phalen in St. Paul, and lives each day with a grateful heart in appreciation of his blessings. What started as a humble request for pennies by Account Executive, Sandra Doody quickly grew into a promising fundraiser for the Union Gospel Mission. JR employees donated $245.11 in loose change. An additional $355 was collected as part of a contest to guess the total value of the change. Additional contributions totaling $600 were also received, for a grand total of $1,900.11. 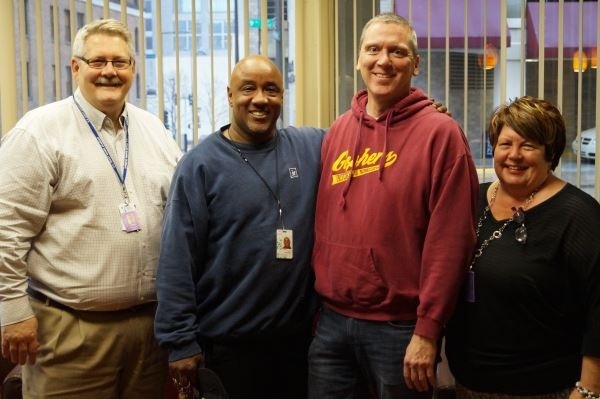 On Friday, November 18th, Greg Harrison and JR’s Director of Finishing Services, Jim Beaudoin presented a check from The John Roberts Company to the Communications and Marketing Manager for Union Gospel Mission Twin Cities, Dan Furry and Director of Adult Education and Training, Gail P. Gisi. Learn more about Greg’s story by watching the video. Learn more about the Union Gospel Mission or make a donation online by visiting their website.